Supervisory Board and Board of Management of Daimler AG (“ DAI ” ) to apply for the discontinuation of NYSE listing of its shares. The top-class awards were presented to Dr. Dieter Zetsche, Chairman of the Board of Daimler AG and Head of Mercedes-Benz Cars, and to Dr. Joachim Schmidt, Executive Vice President Mercedes-Benz Cars Sales and Marketing, at a ceremony held last night in Berlin. This marked the 22nd occasion on which “Auto Zeitung” opened up annual voting for the best cars of the year. No fewer than 104,442 readers cast their votes, carrying the new Mercedes-Benz E-Class to victory as the best car of the year in the luxury class. 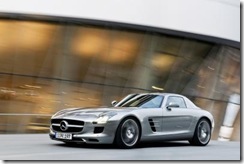 As the global leader in this segment, Mercedes-Benz easily fended off its 19 competitors. Since its market premiere in spring 2009, the new E-Class has successfully made a name for itself with its dynamic design, setting new standards in terms of safety, comfort, environmental compatibility and economy. Contributing to this success is a new generation of engines which operate at previously unattained levels of efficiency. 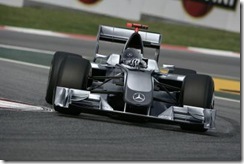 AMG Market News/Daimler Press Release – Stuttgart, Nov. 16: Mercedes-Benz will enter the Formula 1 World Championship with its own team, beginning with the 2010 season, and Daimler AG and McLaren Group will change their form of cooperation with effect as of 13 November 2009. This was announced by Daimler AG today. Daimler AG together with Aabar Investments PJSC will take over 75.1 per cent of the Brawn GP team, with Daimler taking 45.1 per cent and Aabar 30 per cent. The rest of the 24.9 per cent will remain with the current stakeholders. With 9.1 per cent, Aabar is the biggest single shareholder of Daimler AG. This transaction is subject to the approval of the EU and the Swiss cartel authorities. The background to this decision are the new terms and conditions for Formula 1. The “Resource Restrictions” set by FOTA and FIA effectively limit expenditure for the design, construction and running of the racing cars. In addition, there will be a significantly higher income available for a Formula 1 team generated by the commercial rights of the racing series following the signing of the new Concorde Agreement. Laguna Seca (USA) – Automotive fascination and high-tech at the highest level: the new Mercedes-Benz SLS AMG, which is due to be launched in spring 2010. 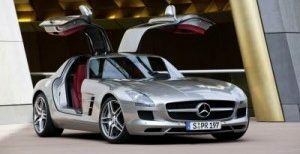 This Gullwing model captivates with a purist design, intelligent lightweight construction and superior handling dynamics, and is bound to cause a sensation in the super sports car segment. 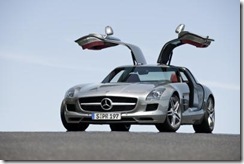 The new SLS AMG is nothing short of a masterpiece by Mercedes-AMG GmbH. As the first independently developed vehicle, the super sports car is the highlight in the company’s more than 40-year history. It not only takes AMG, the performance brand within Mercedes-Benz Cars, into a new era, but also demonstrates development expertise of the very highest order.